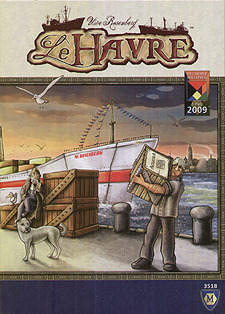 Le Havre is a game about managing a Harbour, building ships and constructing buildings. On each turn, players must decide whether to take goods of one type or to carry out a building action. The number of goods on offer varies from turn to turn. New goods of each kind are added regularly, building up until a player takes them. Wood clay and iron are building resources. Fish, grain and cattle are used to feed your dock workers. Actions in buildings allow goods to be upgraded - just turn the tokens over to show the reverse side. Wood, for example, can be upgraded to charcoal in the Kiln. Where once it could have been used as a building resource, not it supplies more energy. Energy is required, for example to upgrade clay to brick in the Brickworks. And the Kiln and Brickworks are just two of the 33 buildings found in Le Havre. An additional 36 Special buildings, of which only a very few are used in each game, make each game new and different. Players need to build Wooden, Iron and Steel ships at a Wharf in time to meet their food needs, which increase from round to round. With the exception of Luxury liners, ships provide food in every round. Players with ships can also use the Shipping Line to sell goods. Players can also use their currency (Francs) to buy ships and buildings. These can either be built with raw resources or be bought with cash. Any player may enter any building. Many buildings require an entry fee to be paid, usually with food. At the end of the game, the player with the largest fortune is the winner. This is the total of the player's cash and the value of his or her ships and buildings. Le Havre can be played by 1-5 players, either in a shortened version or as a full game (duration 100-200 minutes, less in the shortened version), ensuring that it provides the right level of challenge for any game table. 110 cards: 33 Standard Building cards, 36 Special Building cards, 20 Round/Ship cards, 11 Loan cards, 5 Game Turn/Buttery cards, 5 Round Overview cards. 420 tokens: 48 "1 Franc" coins, 30 "5 Franc" coins, 60 cattle/meat tokens, 60 grain/bread tokens, 30 iron/steel tokens, 42 clay/brick tokens, 48 wood/charcoal tokens, 42 fish/smoked fish tokens, 30 coal/coke tokens, 30 hides/leather tokens. Plus: 7 Supply tiles, 16 Food Production tokens, 1 Starting Player marker, 3 Game boards, 5 wooden Person discs, 5 wooden Ships, 1 Rules booklet and 1 Buildings overview. After the success in 2007 of Agricola, along comes Le Havre from the same designer to offer another card game that is similar to Agricola yet plays very differently and is a superb resource management game in it's own right, offering several paths to victory. During your turn you can choose either to pick up the goods on one offer space, or make use of the special abilities on a building. Once you buy a building it goes in front of you, and the other players can then also make use of the building but have to pay you for its use. As with Agricola, food is needed, and as the game progresses it's essential to buy ships to keep up with the demand.